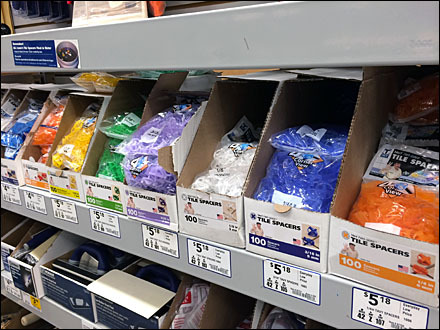 Smart that Armen Tavy® Color-Coded Tile Spacers are merchandised by size for instant visual identification both in-store and during use. Also smart that clear packaging and similar bulk box color codes maintain the identification scheme in retail. Though a low cost, commodity item, I still think the Armen Tavy celebrity sponsored brand would command more respect and attention if faced neatly and not so messy. 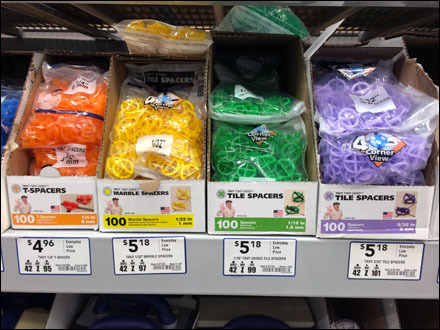 CLICK the thumbnail for a broader view of Color-Coded Tile Spacers.